Shaper Kumena dashed through the undergrowth, his heart pounding. He was barely using his magic—just a nudge here and there so that the undergrowth helped his passage rather than hindering it. Any greater act of spellcraft would have led Tishana straight to him. He could feel it. He was nearing the golden city of Orazca, the resting place of the Immortal Sun. His rivals were behind him, and victory lay ahead. Kumena plunged into a nearby river and swam with the current. The power of the golden city grew nearer, greater, and somehow brighter. He could hear water rushing over some immense structure ahead of him. The waterfall surprised him—the water here felt as if it had only recently been tugged in a separate direction. The river widened. Ahead the water dropped away over the lip of a vast waterfall, and Kumena swam with the current until he stopped himself at an outcropping of gold. The ankle-deep water rushed past, and strange golden spires pierced the treetops of the valley before him. 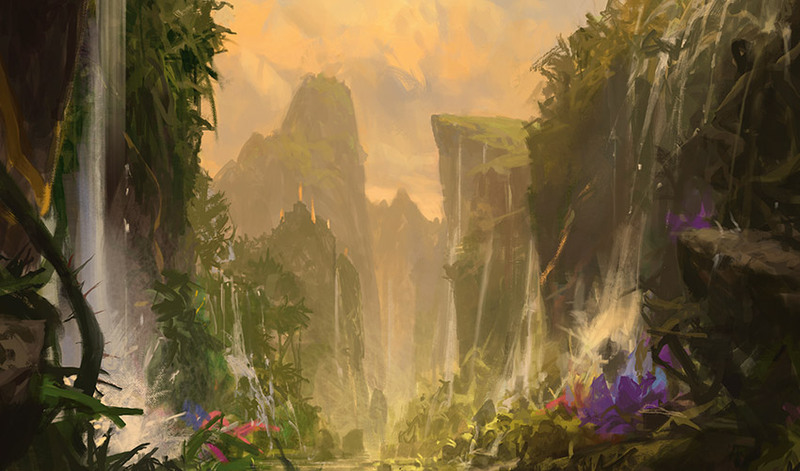 On a shelf of rock across a thin, semicircular canyon, golden spires rose out of the jungle. Kumena made his way around the canyon's rim. Water tumbled into the gorge far below, carried away by a subterranean river. How far and wide does that unseen channel run? he wondered. Does it dwarf the Great River itself? Kumena contemplated what forces lay hidden beneath Ixalan's surface. Orazca itself was massive, but he kept losing sight of it. (Him! A Shaper, the embodiment of his namesake river!) Kumena was impressed at the magic inherent in this place and its ability to remain hidden for so long. He picked his way around its perimeter until at last he reached its entrance: a massive staircase with a great archway at the top. His heart raced and fins quivered. Who else had climbed this staircase in the last few hundred years? Had anyone? What was its original purpose? Why was it built? No, not why. He knew why. They built it for this moment, for him to climb. The stones beneath his feet rippled with power, but it was his own power reflecting back at him. Kumena ascended to the golden city at last. He reached the archway at the top of the stairs, and the sun that shone through nearly blinded him. Gold. It really is made of gold. But gold did not interest him. Eyes watched him from the shadows, animals that made their homes in these strangely pristine ruins. They did not interest him either. He stepped into the golden city. He could feel his power growing already, and he knew with certainty that his rivals were not far behind him now. Light shone from every surface, and the sun warmed his skin. It felt like coming home. Kumena was gripped by a sudden feeling of certainty. He knew where the Immortal Sun sat. It wanted to be found. "Kumena," a voice whispered from the golden walls. "Kumena the Shaper, child of the Great River, leader of your people. Come set me free." Could it be? All this time, the golden city was a prison, not a stronghold? "Who's there?" shouted Kumena. "How do you know me?" He turned, and in the shining golden facades of the city he swore he saw something move. He could not make out what it was—neither animal nor person. He wondered with alarm if it was just a trick of the light. "I know you very well," said the voice, louder now. "Come to me." "How?" said Kumena. "Where are you?" There were reflections in the gold, of a thing that was not there. A face? "Listen," said the voice. "Look. Follow." The voice was deep and commanding, the voice of a leader. It was his own. "Is this trickery?" he asked. "Or am I lost to madness?" The faces were his as well, a thousand tiny golden selves shining at him, eyes alight. "Neither," said the voice. "There is power here, Kumena. The power that was intentionally designed . . . but also an additional, inert power. A still pond. A mirror in darkness. It can do nothing . . ."
". . . without my own power to reflect," Kumena finished. "Is that it?" "Follow," said the voice, and the many golden reflections of Kumena's own face echoed it. "Follow." "I am the Sun, Kumena. As you will be. Follow." It was a command, delivered with all the force of his own convictions. A labyrinth stretched out before him, serpentine corridors of stone and gold meandering off into the distance. Kumena entered the labyrinth and walked steadily, in a meditative trance, following the call of the Immortal Sun around every twist and turn. With every step, his power grew. Every surface was limned in brilliant light. It was too bright, too warm. His fins began to curl and desiccate, his gills grew dry, and still the sun did not move in the sky. Kumena approached a central tower, a gigantic temple. He wandered around it, sensing that this was where the power lay. On one side was a massive, intricate door, its entrance marked with a great seal and a complex lock. But the other side, the side facing a large central plaza, has a simple door leading to a simple staircase. The way to the top. Kumena shivered, though he was not cold, and elected to take the path of least resistance. Up and up, one finned foot in front of the other, until he reached the top. He stepped into the chamber, and beheld the Immortal Sun. It did not look as he expected—a dull-glowing stone surrounded by gold, and embedded in the floor, of all places. A great open window looked out on the city beyond, and if one were to stand on top of the Immortal Sun, one would be able to see the entire city. The Immortal Sun looked like nothing more than a strange decoration in the floor, but it felt . . . it felt like a mirror, not a light. The light was his. Kumena stepped onto the Immortal Sun and took that power, his power. The ground shifted beneath him, and his perspective shifted with it. He was vast, all-encompassing. The shaping magic he dedicated his life to mastering now seemed a fraction of what he was capable of, the digging of children in the sand. He could feel all of Orazca and beyond. What fools the River Heralds had been, to let this power sit unused! 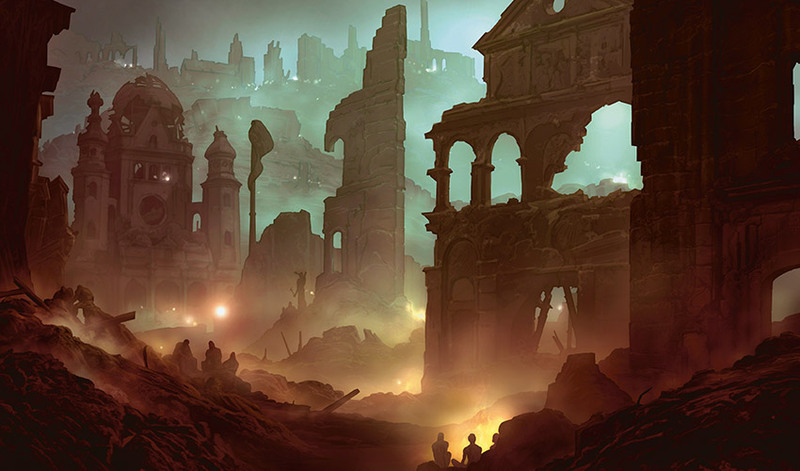 The city was hidden, but it was not fortified, and his rivals had no doubt already tracked him to the central spire. Kumena had reached Orazca far too easily, and they would arrive soon. He could feel them, crawling like ants, though they were far too insignificant for him to identify who among them was whom. He flexed his fingers, and the city lurched upward, separating from the rock around it. The ground shook. Spires hidden for centuries reached upward through the jungle, and the little canyon behind the city yawned wider and farther, surrounding the city like a moat. Rivers plunged into it. Veins of gold beneath the earth ripped open—vast riches, not that Kumena cared. It was nothing but useless metal to him, just a part of the city's absurd bounty, for which he had no need or use. The creatures within the city stirred. The ants beyond it shifted and scurried toward it. They had all been racing for the golden city, but the race was over. 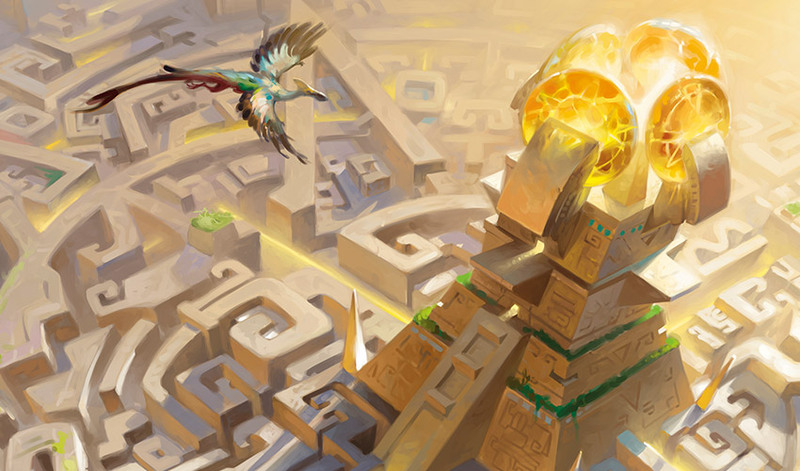 The fight for Orazca had begun, and Kumena would not see his people wiped from the face of Ixalan. Quite the opposite. Quite the opposite, now that he had claimed what was rightfully his. Outside himself, around himself, bathed in golden light, Kumena began to laugh. His laugh was cut short by a noise behind him. Kumena turned his physical form, the one that stood atop the Immortal Sun, and locked eyes with a vampire. She was grinning, and her collar was covered in dry blood. Kumena curled his toes and centered his weight. "It is not yours to take, vampire," he warned. "One conquistador is no match for me." "How about two?" she teased. "What do you say, Mavren Fein?" she tossed over her shoulder. "I say the Butcher of Magan is right in the eyes of the Church to cleanse that which stands in her path," a voice said in response. Kumena saw a second shape come up the stairs. He was a hierophant, with long flowing robes and a staff taller than himself. Kumena began to feel afraid. The two vampires rushed at him. Kumena began to conjure a defense, but was tackled to the floor. The vampires scratched and bit, and one of their swords sliced a long line into Kumena's side. He tried to wrestle the two of them off, but with each push away they would snap their jaws and attempt to hold him in place. Mavren Fein and Vona yanked him closer and reached with their glistening teeth for his neck. This is not how I end. I will not allow them the satisfaction of my blood! Kumena wrestled, struggling from their grasp, and looked toward the window. Vona laughed above him. "You don't want to assist us in our most holy mission?" Kumena spat in her face, and Vona's smile grew even wider. "Then you will die another way," she hissed. She gripped his flesh with unnatural strength, and before Kumena could react, she threw him out the window. Kumena's eyes went wide, and as he fell through the window he saw Vona above him, grinning with manic malice. Jace lay in agony on the riverbank. His hair was matted with his own blood, and his eyes shone with uncontrolled magic. Vraska swam toward him, spitting out dirty water and squinting over the spray of the waterfall. 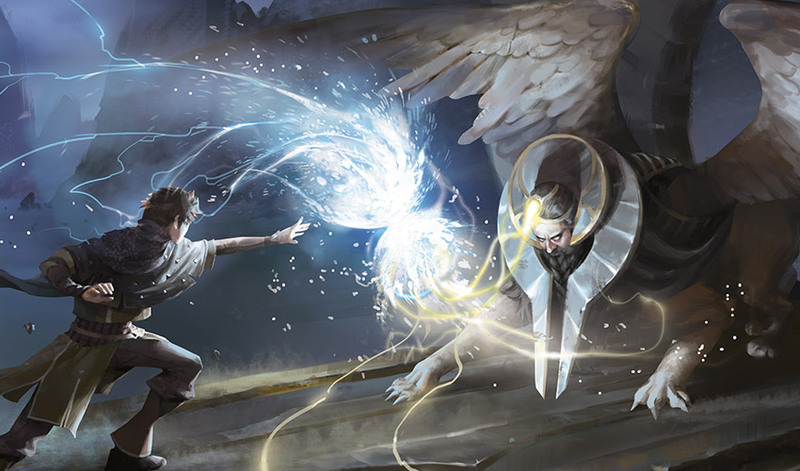 The rocks at the base of the waterfall were jagged and massive—it was a miracle Jace had survived at all. 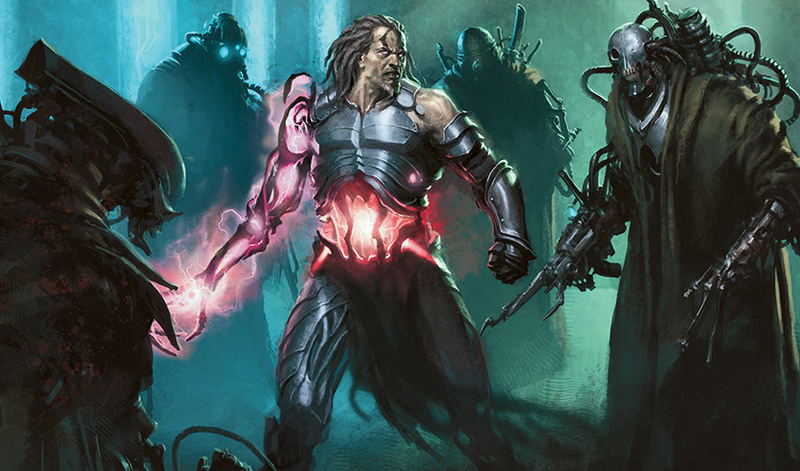 Vraska knew a serious injury could cause memory loss or make problem-solving difficult. One of her fellow assassins in the Ochran had grown quick-tempered after such a blow when she was younger. Jace was a telepath and an illusionist—his brain was his instrument. Vraska knew she was witnessing what happened when that instrument was damaged, and the result was not a weakening, but rather a dislodging of whatever valve prevented his mind from containing itself. He broadcasted his memories now in bursts and stops, clearly trying to wrestle them back under control. It's over, Vraska thought. He is going to remember everything—our fight, my profession, his title. He will hate me, surely. Gorgons are meant to be despised. Vraska cursed and swam toward her friend with a mournful feeling building in her chest. The image was of a plane Vraska had never visited. There was a massive barrier made of white brick against a turbulent sky. The right side of the gate was tainted with a strange bismuth stain, as if a great brush of disease had been painted across its top. 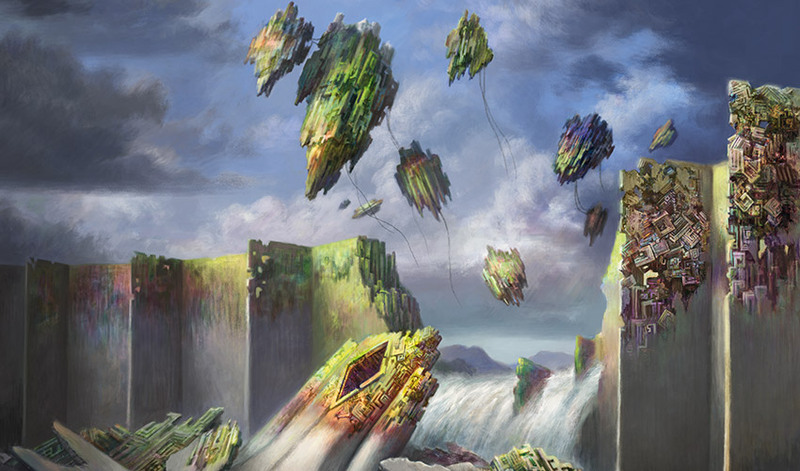 There was a breach at the entrance, and water from the sea poured into a demolished harbor as bits of the destroyed gate floated up and off and into the sky. Vraska screamed in pain as the image tore through her mind. It felt like a migraine magnified, a piercing ache and flashes of aura that threatened to freeze her muscles as she fought the current. It was less of an illusion and more of an immersion. She felt like she was there. The image vanished as her feet touched the riverbed below. She yelled Jace's name to try and distract him, but it was no use. Vraska pulled herself out and clambered toward Jace on the shore. She knelt at his side and tentatively reached out to him with a reassuring hand. Vraska staggered and caught herself with her hands on the ground. Vraska shut her eyes tightly. She wasn't entirely certain which end of the exchange she was on. It was tremendously disorienting. She looked to Jace with a crease in her brow. "Jace, we need to find whoever awakened the city. You need to make an illusion so our crew can find us!" 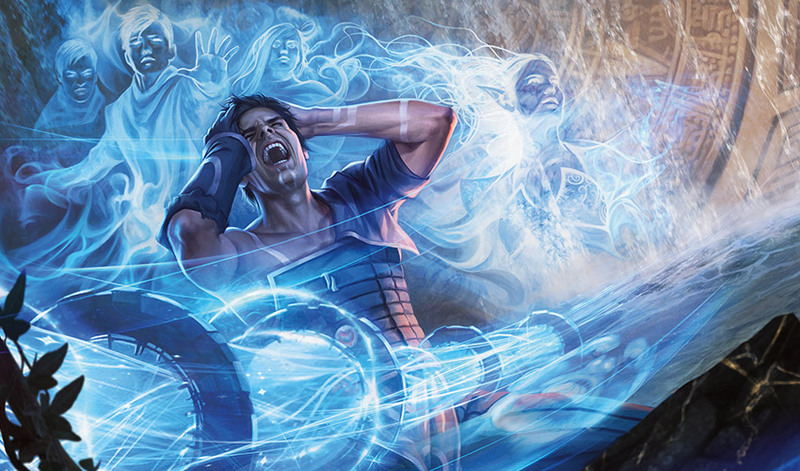 The mind mage shut his eyes and Vraska saw what spilled up and out of his memories. The sound of the river vanished and the hot air of the jungle turned chill. She saw a dark interior, steel-lined walls, and a half-metal man. The air had a metallic tang, and there was just enough light in the room for her to make out the gaps between the metal sections of the strange man's abdomen. Jace was on the ground below. He looked thin and world-weary, just a few years younger than he did now. The man dropped to one knee. He gripped Jace's hair in a shiny metal fist. "I'm going to make damn sure you learn from this debacle." Vraska watched as the man pulled up Jace's shirt and dragged a manablade in long, arrow-straight lines down his back, then one single line down his right forearm. She cringed in horror as Jace screamed. Her breath caught in her throat and her heart beat like a bird caught in a cage. She knew what it felt like to be tortured. She felt hideously guilty—how could she have not recognized that shared hurt in him before? Empathy gripped her chest, and Vraska let out a shivering breath. The sight of Jace and the knife brought back memories of her own she dared not touch, not now, not when their minds were mixed like this. The real Jace gasped, and Vraska's perception of reality flickered back to the sunny riverbank on Ixalan. He was doubled over, hands gripping his own bloodied hair. Vraska had no idea what to do. She wanted to comfort but didn't know how, so she attempted to talk him back to a place of control. "It's a memory, Jace—it's not happening now. You're safe. " Vraska saw bright shimmering lights and felt a deep pain in her head once again. By now she had gathered that this was what signaled another influx of sensory immersion and braced for the impact. She staggered as another illusion took hold. The world rippled, fluid as water, until it settled into an illusion of a dim alleyway. Vraska's sighed in relief. A familiar sight. Ravnica was before her once again. The Jace in front of her was pathetically young. He couldn't have been older than fifteen, and he was seated on a broken chair amid rubble. Vraska recognized the area as one under Gruul control, given the copious amounts of both trees and recently destroyed buildings. Firelight filtered in through ragged hanging canvas, and a haggard-looking Gruul shaman stood nearby busying himself with an enchantment on his own hand. The shaman's arms were covered from shoulder to wrist with tattoos of the city streets. The teenage Jace seated in the chair had the look about him of someone who wanted to disappear and wish someone more imposing into his place. His outfit was disheveled, the cut of it unfamiliar. 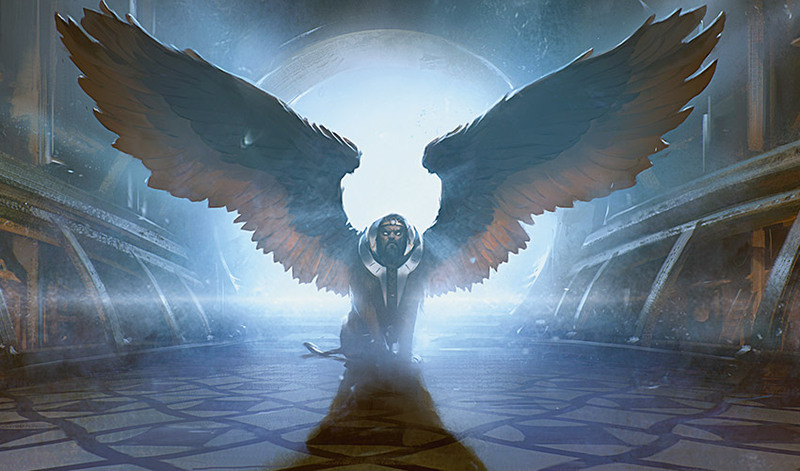 Vraska sensed in the fabric of the memory that this version of Jace had arrived in Ravnica for the first time only days before. The Gruul shaman's hand was glowing brilliant white. "This your first?" he grunted. It took Jace a moment too long to answer. "Yes," he said timidly. Vraska couldn't help but smile at this memory. He was the wimpiest teenager she had ever seen—no wonder he wanted a cool tattoo. It was incredibly charming. She remembered her own young street rat years and grinned at the thought of how well the teenage her and the teenage Jace would have gotten along. We'd have torn up the town, she thought with mirth. No bookshop would have been safe. "Then take a swig of that," the shaman said in the memory, pointing at a bottle on the young illusion-Jace's left. "This'll hurt like a Rakdos comedy." Vraska chuckled at the simile as Jace followed the artist's instructions. He made a face at its taste (she didn't blame him for that) and put on a look of determination. The shaman leaned over the teenager and drew a line with his finger down Jace's cheek, leaving a brilliant white tattoo in its place. He continued on his chin and arm, and Vraska watched as the shaman diligently painted a braver face on the nervous teenager's own. She caught a glimpse of the paper the shaman was referencing. A series of symbols was hastily sketched on it—symbols she recognized from this Jace's future cloak. An elongated ring, open at the bottom, with a circle floating in the middle. She wondered what its significance was. The illusion shattered, then vanished, leaving the rush of the waterfall and the shimmering gold of Orazca in its wake. Vraska's perception was wavering, and everything had an artificial glint to it, as if the accidental illusions were smearing across reality even now. Her hands were still gripping the mud of the riverbank, physically clinging to what was real. "Jace, you're safe and all right, but I need you to make an illusion so our crew can find us." But Jace was still unreachable. His eyes remained bright with magic, and strength had not returned to his limbs. Vraska could see his chest rise and fall with each shuddering breath. He inhaled sharply as another wave of memory washed over him, then went utterly still in response to whatever he was seeing, his lips parted in shock. The light above them dimmed as an illusion of this new memory coalesced into being, bringing with it the weight of dusk and the scent of too-ripe apples. Vraska found herself in a small bedroom with bare walls and two chairs in front of the fire. She wasn't sure what plane she was on, but that was irrelevant. This room was a world unto itself, the furniture its continents, the rug its ocean, as if nothing outside of the space mattered. Dust clung to the windowsill, and a half-empty basket of fruit sat by the door, boasting a collection of bruised apples. Jace was there, naturally, and his face was lit by the cozy-looking fire. The texture of the memory was velvety and welcoming, but Vraska saw no joy in the scene. Jace was seated in front of the fire, across from a woman in violet. Everything about the woman's body language exuded boredom, but Jace was leaning forward, rapt with interest. Vraska felt deeply uncomfortable. This was an intimate moment. She was not meant to see this. "I never want to play chess again," Jace said, rubbing his temples. The woman regarded him with intense disinterest. "Chess is tedious," she said in dull agreement. Jace's cloak was hanging on the coatrack. His shoes were drying by the fire. Vraska knew she shouldn't watch, yet she knew she couldn't leave. Jace's left index finger was tapping a rapid, unconscious rhythm on his thigh. His voice was tentative. Uncertain. "What you said back on Innistrad, about when I die . . ."
The woman's long hair tumbled over half of her face. Her lipstick was end-of-the-day faded and her eyes betrayed an indifference that Vraska prayed this version of Jace would notice. "Hard to forget a conversation like that," said Jace. "You don't meddle in sentiment unless you mean it. So . . . did you mean it?" He paused, cautious. "Will you be sad when I die?" Jace was looking at the woman in violet attentively. Expectantly. Vraska's stomach lurched at the strangeness of the question. He had asked it as if he was unsure, even though the context of the moment around him implied that he and this woman were more than acquaintances. The woman in violet looked Jace in the eye, lids heavy, knees resting to the side. "I expect so," she said. A half sentiment. A bone for the dog. "What we had, whatever you want to call it . . . it's worth that much, at least." Vraska's mouth hung open. That's it? The woman's cruel dismissal of an honest plea for affection told Vraska everything she needed to know about her. Vraska's tendrils knotted in discomfort, but she couldn't look away from this poor man, this woman, this dreadful little room. "I think that's the nicest thing you've ever said to me," Jace replied. The woman in violet laughed. As though it were a joke. As though he hadn't said it with a desperate yearning for her approval written plainly on his face. Vraska felt like a home invader. This domestic play of profound imbalance wasn't meant for her to see. "You should go back. The others will notice if you don't come home tonight," said the woman. Jace shrugged. "It's just past sunset. I've got time." "Oh." The woman looked Jace over, visibly weighing some decision in her mind. She stood up suddenly and crossed the room toward her vanity. Vraska sidestepped her and watched as the woman opened a drawer. She pulled out a bottle and two glasses and returned to the fireside, deftly uncorking the decanter with one swift motion. "What should we drink to?" she asked. You don't pour a glass for someone you want to leave, Vraska thought as her stomach dropped. Jace was smiling. "A toast, to Emrakul," he quipped, "for doing our job for us." The woman lifted her half-filled glass and clinked it against his. She refilled their glasses to the brim. Vraska couldn't take her eyes off the other woman. For someone who hated chess, she sure looked at Jace with the icy scrutiny of a grand master. At last the woman in violet decided her play, disguising her probe with a lethargic sip from her glass. "Have you seen anyone since?" Vraska could hear the weight implied in that "since." The designation, the shared knowledge. "You got along well with the moonfolk woman," she added deliberately. Pawn to E4. The game behind the statement made Vraska want to claw her way out of the room. Jace swirled the liquid in his glass and his demeanor suddenly shifted. He glanced up at the woman in violet. "She's married." "Is she?" the woman said, superficially pleased at the revelation. She knew full well how aggressive her opening move had been. Knight to F3. Jace's nodded. "She was a scholar. Morally ambiguous. Married, and not what I'm looking for even if she weren't." The woman in violet was watching him closely. "And what are you looking for?" she asked. She's manipulating you into staying, Vraska wanted to scream. You're smart. She doesn't reciprocate your feelings. Don't fall for this. Jace leaned back in his chair and stared at her over his glass. With great trepidation and an uncharacteristic absence of logic, his answer fluttered out. "This isn't so bad." Vraska's heart ached. This was so bad, but he was too far lost to pull back the curtain of affection and see the bored cruelty of her intentions. "This is just two old acquaintances, relaxing after a victory," the woman responded. "Reminiscing about the good old days." Jace absently tugged on his right glove. "Those days weren't all good." "We weren't, either," the woman said in a hushed, dangerous tone. In a moment, the game transformed, chessboard tossed on the floor, metaphorical dice on the table. She was a gambler, floating an offer for one more round, one more bet, just for the hell of it, c'mon, fellas, what's the worst that could happen. "We're not together," the woman in violet added. "But you don't have to leave just yet." Jace looked up from his drink and met her gaze with a hopeful look. The woman topped up both of their glasses and lifted hers. "To new good old days," she said. To Vraska's relief, the illusion dissolved, and the riverbed returned. Vraska felt nauseated. Was there anyone in Jace's life who hadn't tried to take advantage of him or his talents? She was starting to worry. The attack of reminiscence was not easing up. "Jace, I'm so sorry. I wasn't supposed to see that last one, but I'm so sorry that woman . . ."
A distant roar interrupted her. Vraska froze, alarmed by the immense noise in the distance. She stood and stared in the direction it had come from. It was most certainly a dinosaur, but of a size she did not know they could reach. "Jace . . . we need to move." Jace gasped in surprise, his eyes still blown out and blue with the flood of his own magic. He choked out a single word. 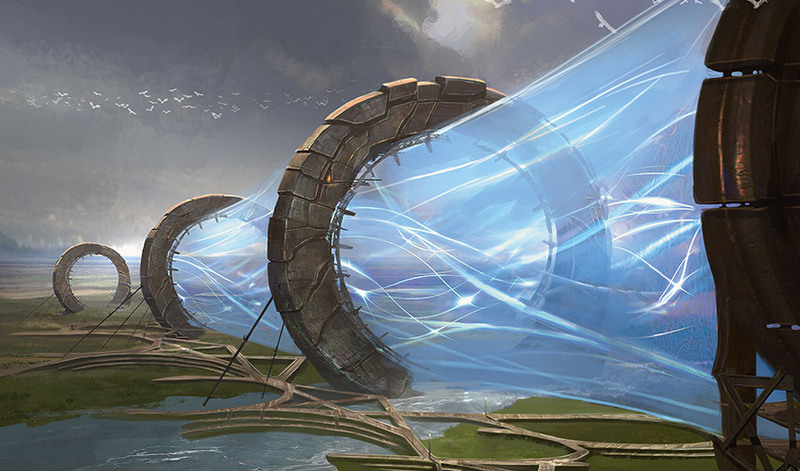 "Vryn—"
—and a massive circular structure blinked into Vraska's view. This place was Vraska's kind of beautiful. A gritty frontier on the edge of civilization. She knew without a doubt that this was Jace's home plane. Jace, I'm still seeing what you're seeing, I don't know how to help you! Vraska thought, desperately, hoping that Jace would be able to hear and respond telepathically. All she felt in return from him was a projected wave of absolute despair. Jace was entirely out of control. His older, deeper memories spilled from his mind in a difficult-to-follow torrent. A woman's face. Her skin was peachy and flecked with freckles, her chestnut hair pulled back from her tired eyes. She was reading to her toddler from a notebook as she wandered the tiny kitchen, excitedly explaining a new healing technique while peeling vegetables for dinner. A peel fell onto the page like a bookmark. The scene was awash with the smell of violets. The woman was lovely. Vraska didn't mind her view into this part of Jace's past—it was nice here. The same woman appeared again, this time wrestling a shoe onto a child's foot. Her toddler was whining and kicking before he suddenly reached down to tie his own laces with clumsy hands. The mother startled, as if she had never taught him how to do that. The flashes came more rapidly—the same woman over and over. Checking under her son's bed. A flash of reality—the true Jace was on the ground, his hands in his hair and his forehead pressed to the earth. He was consumed by the act of reliving, and Vraska realized in horror how many times Jace's mind had been tampered with. She saw his psychic mastery by the time he was thirteen (Vraska shivered—how the hell could he do that at thirteen?! ), his fury at discovering what had been taken, his desolation as he realized how many times he had been manipulated. Encompassing, overwhelming, dominating it all . . . was a sphinx. The world around them violently lifted up and above to become a rooftop at dusk. Vraska's perception jolted, and she saw the memory through Jace's eyes. The same huge rings from earlier repeated out and out into the distance, the sky turned an angry gray, fat raindrops fell like pellets, and the sphinx Alhammarret was crouched to attack in front of her. She sensed Jace's bruises under his tunic, felt the panicked sweat on the back of his neck despite the biting cold. She felt Jace's past rage roil in her chest. She saw how this mentor had betrayed him, had manipulated and molded him into a tool to be used rather than a student to be taught. Vraska lost herself in the memory. She felt her mouth move with the words of a teenager. Her voice was masculine, young, just past its pubescent breaking point. "Help me find my limits. Pry the information out of me!" 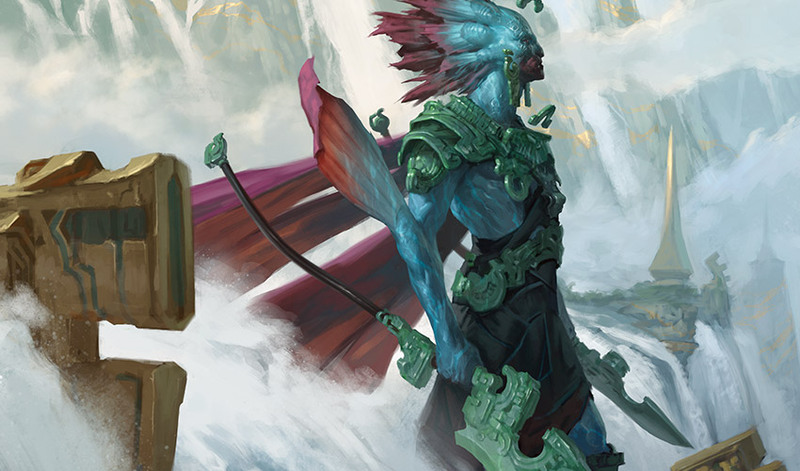 The sphinx stood on his hind legs, and Vraska felt it as they dove into each other's minds. Alhammarret seemed to freeze, his mind becoming as accessible as a bookcase. Deep within his brain was an ethereal structure, its construction complex: marble lining a nearly endless well. Vraska was captivated by the strangeness of what it felt like to wield a magic so different from her own. She and the past Jace both felt the strange marble of the well of Alhammarret's mind reach to attack. In a fraction of a second, a moment of instinct, Jace reached out defensively with his own mind. His power invisibly shot forth like a like a fist, like a hammer, then multiplied into a battering ram, aimed all its force at the sphinx's fragile mind, and broke it. That strike, in Alhammarret's mind, was more ruinous than any explosion, more destructive than any earthquake, more calamitous than any meteor. What was a well of weathered marble violently collapsed against itself in a catastrophic implosion that deafened the senses. But Jace had struck out too hungrily, too hard, and his own memories were ripped away in the process of psychic demolition. 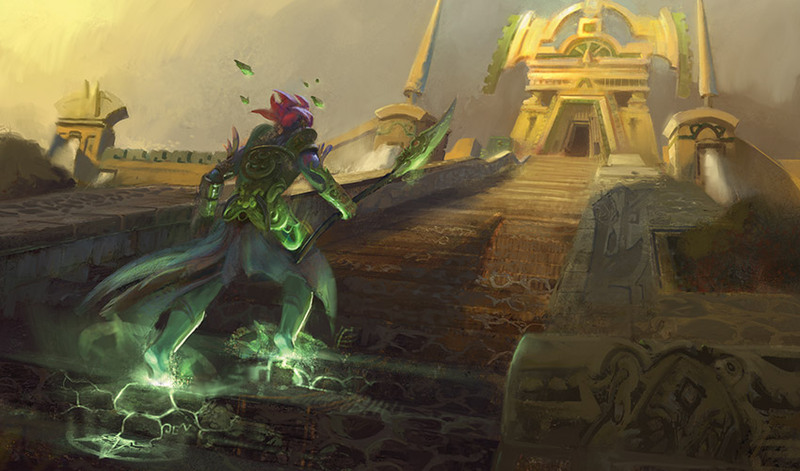 A long droning whine yanked Jace and Vraska out of the sphinx's mind and back to the rooftop in the driving rain. The massive body of the sphinx was prone, his eyes open wide with confusion. Alhammarret manually sucked in air, pushed it out, and began to scream. It was the terrified howl of an infant. A frightened wail at a world too large and too loud and astonishingly unfamiliar. He seemed unable to manipulate his limbs with any agency and shrieked even more, his massive wings thumping against the hard concrete of the roof. After every howl, he gasped for more air, and with each exhalation, he vocalized his terror and confusion. The past Jace fell to his knees as his own memories locked themselves away, and grasped the sobbing sphinx's head in his hands, feeling for the broken mess of Alhammarret's mind to try to piece it together. I did this, she felt Jace think to himself, I did this. The sphinx's screaming wouldn't stop. He stared with wide unblinking eyes and continuously wailed in horror at his own existence. Vraska shared Jace's alarm. Alhammarret had ruined him, abused him, torn his mind apart time after time, but what the sphinx was suffering now was a fate worse than death. Alhammarret deserved to perish, but no one deserved this. In that moment, Vraska felt as Jace began to instinctively planeswalk away. Jace's own injured mind was still actively locking itself away; it was like racing through a passageway of jagged rocks, and the faster Jace tried to planeswalk away to escape, the more memory was ripped from his sides, scraped from his psyche and torn away from himself. Gone was the face of his mother, his family, his home, his past. All that remained was the image of the sphinx's collar, an elongated ring, open at the bottom, with a circle floating in the middle. In the fabric of the memory—the one memory he would be left with—Vraska realized that symbol would be the only thing that would help him preserve his name, but nothing else. Vraska felt herself yanked up and out of the memory, violently expelled, and the illusions of the world sped by and dissipated. As fast as she had been sucked in, she was back on the rocks and mud next to the waterfall, standing in the sunshine under the spires of Orazca. The current Jace, the Jace she knew, the illusionist, pirate, and companion, was lost in grief on the riverbank. Vraska instantly dove to the ground and scooped him into her arms. He wept a lifetime's worth of tears. She held him tight, and tucked his head into the crook of her neck. It was the first time she had touched another person willingly in years. The sensation was alien and alarming, but utterly necessary. Jace sobbed and sobbed into her arms, and she gripped him all the tighter. He had spent more than half of his life with no memory of his entire childhood. He had forgotten so much. He had forgotten so many times. She held him for all the times she wished someone had held her when she was imprisoned. She hugged him close for every time she had asked for help and been hit in return. She had spent so much of her life alone and shut away, it was impossible for her to deny comfort to someone who, like her, had suffered such an immensity of hurt. Vraska looked up and saw an illusion of herself. The grime of the riverbank was traded for the brisk daylight of Stormwreck Sea. The gorgon had blossomed into a captain, and this Vraska was singing a Golgari folk song at the top of her lungs as her crew cleaned the ship. Everything about that moment was happy and pastel, and Vraska felt it as the past Jace tried to sing along with the strange melody. Vraska smiled, for she remembered that moment too. She remembered being surprised he could carry a tune as well as he did. The illusory Vraska transformed, and Vraska's hope collapsed in on itself. The memory of Vraska became crueler, uglier, snarling and furious. Her tendrils whipped at the air, and her dress seemed to be made of shadow. The grit of Ravnica towered over them, and Vraska saw herself through Jace's eyes. It was the first time they had met. The past Vraska was pointing at Jace, but it seemed to Vraska that her past was pointing directly at her, asking for an ally lest she retaliate with violence. Vraska felt Jace's fear, sensed his trepidation and fury. He didn't know what she meant to ask. He didn't know why she had done what she did. He did not know, and when he had looked at her then, he saw her only as a killer, a beast. Vraska felt sick. She hated seeing herself this way, like the monster the rest of the world saw when they looked at her. The gorgon in front of her was prepared to kill, and Vraska felt ashamed to see herself painted with such malice. It was all over. Jace was remembering everything, and once he was able to understand it all, he would see her as nothing but a monster, no matter how wonderful the last few months had been. The memory vanished and the riverbank returned. Vraska let go and backed away. Jace's convulsive tears were slowing, and fatigue was settling in. The illusions vanished. The glow of magic ceased. Jace pulled his hands away from his head and looked at the mixture of his own blood and the mud of the river that covered them. Vraska wanted to clutch him close until he was whole again. She wanted to planeswalk to the farthest corner of the Multiverse. She wanted both to hold him and to vanish, and she froze in the process of deciding which was the better option. Jace looked up at her, and his eyes were hopelessly red with grief. "You saw everything," Jace remarked in an empty voice. Vraska felt awful. "I saw what you couldn't contain." He looked away, embarrassed. "You're an assassin," he stated as the memory settled into place. "And a friend," she responded plainly, sadly. Jace's awareness was distant. He may have found a way to prevent his memories from spilling out again, but he was visibly struggling to his thoughts internally. His voice remained hollow. "Emmara. Nissa. I have so few friends . . ."
Vraska's heart was aching. She didn't know what to say. He shut his eyes, grimacing in pain. The control was back. The lid was on, and he seemed determined not to show any more emotion. Either that or he had simply cried himself out. 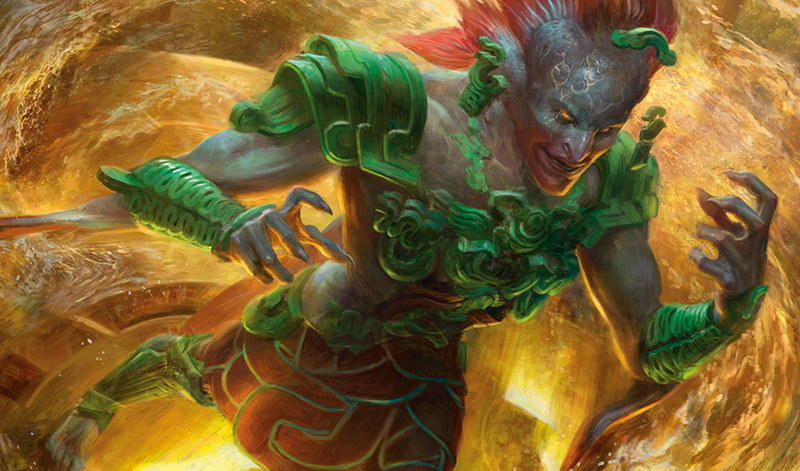 Vraska sensed it was the latter—he looked like he had run a marathon. She decided it was best to wait for him. Vraska shrugged off her coat and wrung the river water out of it. She checked herself for bruises and sprains, then craned her neck toward the staircase that led to the city above. All the while, Jace tried to calm himself. Every now and then, he sighed with the weight of memory, but the worst seemed to have passed. He shook his head gingerly. "It's not all back. There are gaps. I don't remember how I lost my memory, or how I got here." "Don't pick your scabs," Vraska said quietly, realizing half a moment too late how stupid and mundane her advice sounded. What could she say to someone who had just regained so many difficult memories? Vraska sat, choosing a spot several paces away from Jace. The sun was warm, and she could already feel it baking away the wetness of the river from her clothes. She looked at his tattoos and recognized them for what they were. Alhammarret's collar, the symbol to which he attached his name. Even as a teenager, Jace was clever enough to mark it on his skin to ensure he would never forget it. "I'm sorry I tried to kill you on Ravnica," she said. Jace made a pained noise and closed his eyes, shivering through another wave of pain. "I would have listened if you had explained why." He shifted uncomfortably. "The people you killed to get my attention back then . . ."
"A murderer, a defiler, and a trafficker of innocents, with names that sounded like planes." She shrugged and shook her head firmly. "I don't regret their deaths, but I do regret thinking it was the only way to get you to listen to me." "I forgive you for trying to kill me," Jace said softly and honestly in return. "You were doing what you thought was right for your people." Neither of them could think of anything to say after that. Vraska stood up and began to pace the riverbank. For the first time she got a good look at the newly visible city of Orazca. The golden walls and spires reached high above even the tallest trees of the jungle, shining in the light of the sun. 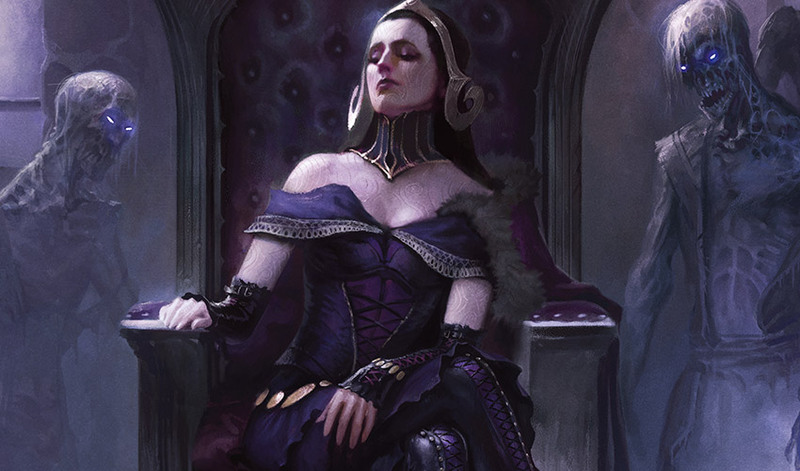 Vraska could make out etchings of great men and women on its sides. At the center of the city was a tower that dwarfed all the rest. She pulled out the compass, and sure enough, its light pointed an arrow-straight line toward the tower. From her vantage, she could see an endless staircase crawling from the other side of the brand-new river up to an archway above that would lead into the city. She looked back at Jace. He was extraordinarily still, his eyes looking far away in the distance. He seemed bolted in place on the riverbank, as though he was so heavy that no amount of wind could rip him from his grief. Vraska couldn't help but stare. He had gone from child prodigy to spy to victim only to have it all forcibly exorcised from his heart and mind. He had turned, lost and afraid, to people who preyed on the lost and afraid. He had been tortured, ignored, manipulated, and despite it all he was, nevertheless, intact. He had survived. "I've never known a version of myself with my memories unimpaired," Jace said, breaking his silence with weary honesty. "So many people manipulated me into hurting so many people. And sometimes I've done it of my own volition. It was so easy." Vraska knew firsthand how easy it was. "You have been hurt and manipulated and abused. You should have died so many times, and despite it all you did what you had to and survived. That is a miracle worth celebrating." Vraska's expression turned serious. "Do you remember the last three months?" Jace nodded. He smiled tightly. "It was the best three months of my life." Vraska dared not blink, lest the spell of utter honesty between the two of them be broken. "That Jace is one of the best people I've ever met." His glance turned into a stare. The expression in his eyes was one of disbelief. He was brilliant, sharp as a dagger and bright as a blaze, but he looked as though he did not understand how the compliment could be directed at him. As if he had already disqualified himself from being worthy of her praise. Vraska poured truth into her words as she spoke. "The Jace I met listened to me in a way that no one ever has. Do you realize how special that is? No one has ever listened to my story, or cared that I had one in the first place." She could see the glint of sadness in his eyes as he shook his head slightly, upset on her behalf. She continued, "That Jace believed that everyone has it within themselves to reinvent who they are. That Jace is still in you, and I think that Jace is who you really are." "That is who I would rather be," he said. "Don't you have a say in how you turn out?" "I want to believe I do, but how can I choose to be who you think I am when I remember how many times I've let people take advantage of me? How many people I've hurt . . ."
"No one ever chooses to be a victim," Vraska interjected. "You are not weak because you were taken advantage of. And the cruelty of what they made you do reflects on them, not you." "I can't help feeling foolish." "I know. But you're not." Jace went quiet for a moment, remembering something that (thankfully) did not spill over into Vraska's mind. "My mother—" Jace's voice stuttered slightly, and he paused for a breath. "My mother wanted me to move to the city to be a scholar." 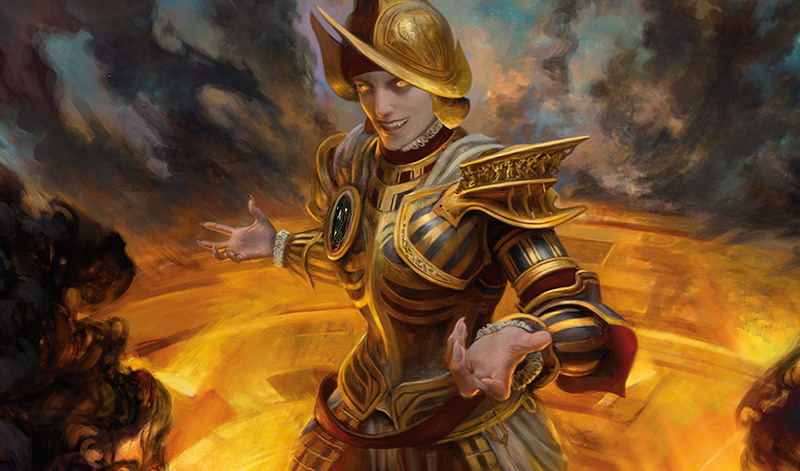 Vraska smiled. Her words came slowly and deliberately. "You moved to a damn good city. And you became a damn good scholar," she said, pretending not to notice him fighting back the swell of emotion that her simple affirmation had caused. Jace kept his eyes closed. "I used to imagine my parents hated me. It made me feel better about forgetting them if I pretended they were cruel. That way, no matter what I chose to do, I never felt like I was disappointing anyone." Vraska was struck by his honesty. "Do you feel like you disappointed her?" He thought over his words before answering. Eventually, he looked at Vraska. "I feel . . . like I want to make her proud." His voice turned hopeful at the end. Happy, almost. That earnest man who could take apart a telescope and put it back together, could disguise a tall ship with his mind and fight back-to-back in a raid, who delighted in puzzles and piracy, he was there after all. Vraska smiled. "Then I think you know exactly who you ought to be." The golden staircase loomed overhead. Vraska held out a hand to help Jace to his feet. She nodded toward the staircase weaving its way up the cliff to Orazca. He took her palm in his and got up, wincing at his own headache and squeezing her hand in thanks. He looked up at the stairs. "I wouldn't have had the strength to climb this a year ago," Jace said with a little bit of pride. "Or if I did, I probably would have passed out halfway up." "You weren't that out of shape when I last saw you," Vraska teased. "You're ignoring how often I used to use illusions to make myself look like I was in shape." Her brows shot up. "Seriously?" "Oh yeah," Jace acknowledged. His expression was unguarded, eyes still red from emotion, a lighthearted tilt to his lips. Unapologetically human. He grinned. "I used to be a coward." 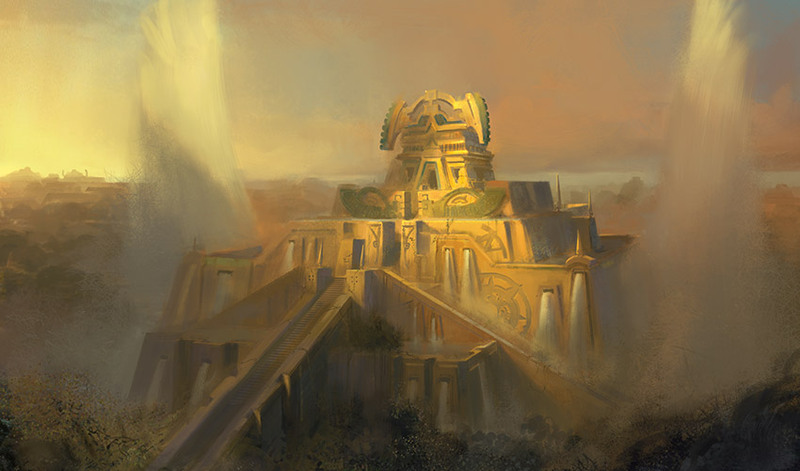 He let Not anymore hang unspoken in the air between them, and Vraska caught his smile as he turned to ascend the golden staircase toward Orazca, one strong step after another.